Not only does calf augmentation restore symmetry and balance to the entire body, but the legs are more contoured, as well, A. Chasby Sacks, M.D. said. He described his calf augmentation method as a "simple, quick, very gratifying procedure." Dr. Sacks, a leading expert in the calf implant procedure, has lectured on calf enlargement to international groups of cosmetic surgeons. He has an international patient load for this procedure. Because there is a growing interest in this subject, but few surgeons or Internet sites are exploring it, Dr. Sacks offers the information below, as well as a link to a description of the Surgical Procedure. He also has included a few of his patients' Before and After pictures. You are encouraged to call for an appointment to receive a free personal evaluation and answers to all of your questions. 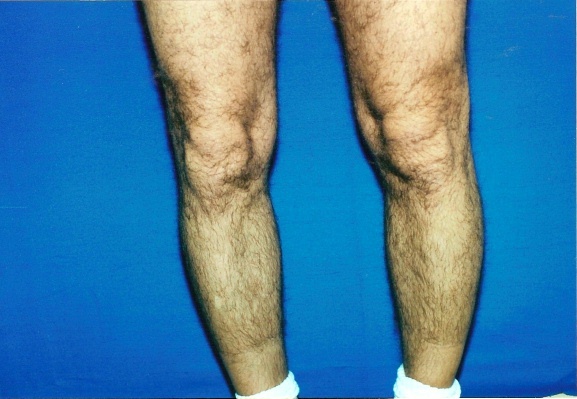 Calf enlargement is a procedure that can help to restore symmetry to the legs when the calf is much smaller in relation to the thigh than looks balanced or when the lower extremity as a whole is thin as compared to the upper body. For body builders, the calf muscles are usually the most difficult of all muscles to enlarge by exercise and they often request calf implants or calf augmentation for this reason. Occasionally, after a disease such as poliomyelitis or after a surgical muscle release procedure as in club-foot, there is asymmetry between left and right sides and only one leg needs augmentation. 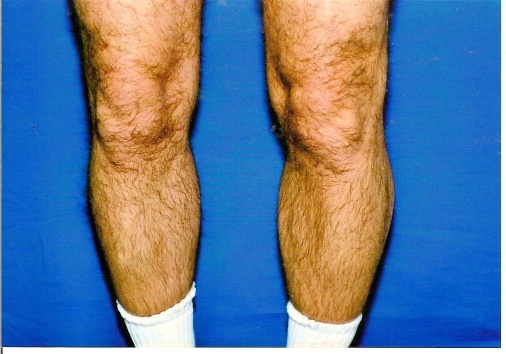 In keeping with the anatomy of the main calf muscle which has two heads, two implants are usually required in each calf to achieve maximum enlargement, but occasionally only inner side implants are required such as in "bow legged" patients. How is calf enlargement performed? Silicone elastomer implants are available in at least four sizes. With few exceptions, most men require an extra large, large, or medium size implant, and most women require a medium or small implant. On the day of surgery with the patient standing on a short stable stool, and Dr. Sacks sitting on the floor, the chosen implant is carefully placed in the desired position over each calf muscle. Then the incision lines are marked in the crease already present behind the knee. While a single central incision has been described, Dr. Sacks prefers two incisions on either side of the mid-line, which is both helpful in avoiding injury to any anatomical mid-line structures and aids in the correct placement of the implant. The incisions each measure about 4-5 cms depending on the size of the chosen implant. After surgery, the lower leg is placed into a compression stocking or ace wrapped from toes to above the knee. Post-operatively, leg elevation, ice, and continued compression for about 10 days are helpful to avoid complications. A recent patient, a young lady in her twenties, would not wear short dresses in public, but after surgery she changed her job and became a flight attendant and is fully comfortable showing her more symmetrical legs. Infection is extremely unusual as Dr. Sacks prescribes antibiotics to be taken starting the day before the surgery and for about one week afterwards. Displacement of the implant is rare but can be corected by wearing a tight strap at the highest point of the implant for a few weeks and is usually caused by too much activity in the early phases of the healing. Numbness is unusual and if present is most often temporary. Prices of Calf Augmentation (enlargement) Ranges from $5500 to $6500 depending on type of anesthesia chosen but watch for specials!!!! If you are interested in learning more about calf enlargement, please call our office. We will be happy to answer your questions or make an appointment for a FREE consultation. Please call Arizona Cosmetic Surgery at (602) 277-1111. If you are outside of Arizona, please call (800) 765-2771.